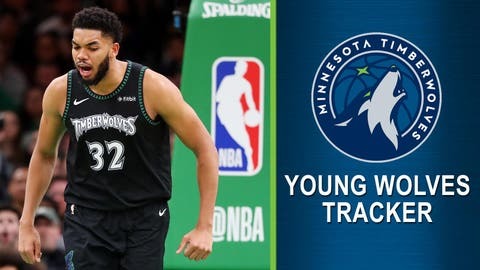 This is the 22nd and final edition of the 2018-19 Young Wolves Tracker. For all the drama that characterized the first few months of the season — Jimmy Butler left, Tom Thibodeau was forced to, etc. — Towns’ ascent is officially back on. With interim head coach Ryan Saunders’ strategic support, Towns is back to looking like a franchise player. He averaged 24.4 points, 12.4 rebounds, 3.4 assists and 1.6 blocks on the season, while shooting 51.8% from the field and 40% from deep. Year 4 KAT was impossible to guard at times, averaging a second straight 50/40 season, a line that could become a historic 50/40/90 with a little more consistency at the line. At this rate, that seems awfully possible. In true “unicorn” fashion, Towns is the first player ever to average 12-plus rebounds, four-plus 3-point tries and a 3-point percentage of 40% or better. KAT was at his best when the Wolves were theoretically still in the hunt. He had a 71.5 true shooting percentage in February, averaging 30.9 points per game, and went on a monster run that carried the Wolves into March: 42, 28, 41, 24 and 40 points on 57.1% shooting. He averaged 6.4 3-point tries per game over that span, shooting 46.9 percent from deep. Now a two-time All-Star, Towns’ future is bright once again. — Tyus Jones made a little history, breaking Terrell Brandon’s single-season record for assist/turnover ratio. Jones averaged 6.96 turnovers for every turnover in 68 games this season. This was a pivotal season for Jones, a restricted free agent this summer, and he got his shot, starting the final 15 games of the season with Jeff Teague and Derrick Rose shut down. — Thibodeau’s parting gift to the Wolves was a seemingly successful draft. Josh Okogie stepped up when fellow forward Robert Covington went down, starting 52 games and showing flashes of major potential. — Keita Bates-Diop, the Wolves’ second-round pick, has looked good in limited action. He joined the Wolves’ rotation full time in March after starting the season in the G League, averaging 21.4 minutes per game during the final month of the season. — Rose missed the final 15 games of the season, but 2019 was a largely successfully return to form for the one-time star. A questionable signing following his failed stint in Cleveland, Rose averaged 18 points per game on 48.2% shooting in his age-30 season. He went off for 50 points in a win over the Utah Jazz in October, one of the high points of the season. — Newcomer Dario Saric, acquired in the Butler deal, emerged as a solid piece of the Wolves’ rotation, starting 28 games in 68 appearances. — Andrew Wiggins numbers declined in Year 5, most notably his shooting. Wiggins had an effective field-goal percentage of 46.1, his worst since his rookie year, and a true shooting percentage of 49.3, his worst as a pro.